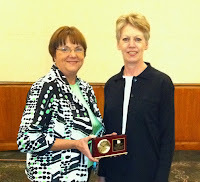 Janie Boswell, ACP received NALA's 2011 Affiliated Associations Outstanding Achievement Award during the Association's Annual Conference in July. This is the pinnacle award of the NALA Affiliated Associations and recognizes exceptional achievement in leadership and service to a NALA affiliated association. Janie is a member of the Nebraska Paralegal Association (NePA), a NALA affiliate. 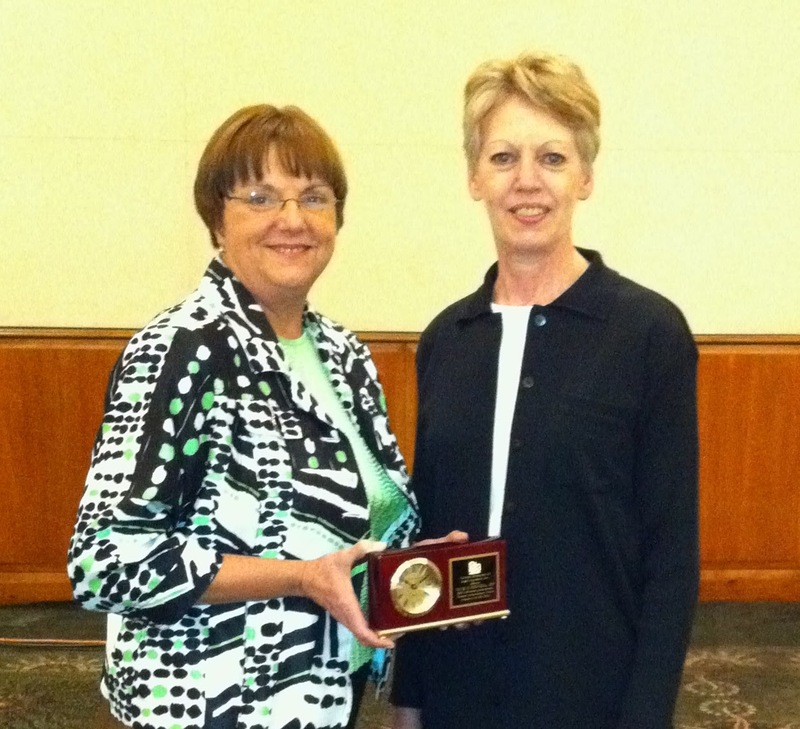 She is shown here (left) with NePA member Linda Hess, ACP. Janie has 30 years of paralegal experience, including the past 14 years at Mutual of Omaha where she is Manager of Legal Administration. In addition to managing a team of 13 paralegals, she works in mergers and acquisitions, commercial real estate financing, securities law, and corporate law. Even with such a demanding career agenda, Janie has remained active in leadership roles for NePA and NALA. She has served as NePA's President, Treasurer, Secretary, and Parliamentarian and is Co-Chairing the Association's 2012 NALA Convention Committee. She is also a member of the CP Review Course Committee and teaches the general law section of the course. She serves on NALA's Advanced Paralegal Certification Board, (and was recently appointed APC Chair), was Region VI Director for four years and formerly served on the Certifying Board for three years. She is a strong advocate for the paralegal profession and serves on Omaha's Metropolitan Community College Paralegal Advisory Board. Janie's academic Paralegal Certificate is from the Lamar University Paralegal Institute, Beaumont, TX. She also has a Bachelor of Applied Arts and Sciences Degree from Lamar, and holds an MBA from the University of Nebraska, Omaha. Her ACP is in Estate Planning and Probate. Congratulations, Janie! Is your resume up to par? Will it rise to the top in a stack of other paralegals’ applications? 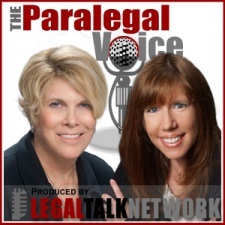 Be sure to listen to the latest edition of The Paralegal Voice, “Paralegal Resumes 101: How to Stand Out from the Competition,” where Lynne DeVenny and I present a 101 course about paralegal resumes. We share our own experiences preparing and reviewing resumes, offer suggestions for handling the “no experience” issue for newcomers to the field, discuss the recommended formats for paralegal resumes, and provide tips to distinguish yourself from the pack of competitors for every job. The Paralegal Voice is produced by Legal Talk Network and sponsored by NALA...The Association of Paralegals and Legal Assistants. The Don and I really like a big salad for dinner. It was warm enough on the last day of summer to have dinner on our porch so a big salad sounded like a terrific idea. I decided to make Panzanella -- which is really bread salad. Panzanella is chock full of fresh vegetables that serve as an excellent excuse to eat the tasty sour dough bread cubes that are toasted in olive oil with a sprinkling of kosher salt. We love it and it is a meal in itself. To save on dishes, make the entire salad (beginning with the dressing) in the bowl you'll be serving it in. You'll need a big bowl. Cut 1 small loaf French bread (I use sour dough bread) into 1" cubes -- you should have about 6 cups. In a large saute pan, heat 3 tablespoons olive oil. Add 1/2 the bread cubes and sprinkle with kosher salt. Cook over medium heat, tossing frequently, for 10 minutes until nicely browned. Remove to a plate and repeat with remaining bread cubes, adding more oil if necessary. Step 4: Mix and eat! Stir the bread cubes into the vegetable/vinaigrette mixture. Serve immediately. In this picture I've spooned the bread cubes on top of the salad and am ready to mix. Original recipe says it serves 12 but The Don and I can eat most of this ourselves, probably because I don't make anything else to go with it. There may be a bit leftover and it's quite tasty the next day. In today's Wednesday's Wisdom, the focus is on choices. When I was at a Big Box Store over the weekend and was tempted by the never-ending supply of Halloween candy, I was reminded that we make choices everyday -- from the moment we wake up until the moment we fall asleep. The interesting thing is that we often believe we don't have choices and act as if something is already decided for us. I’m right there with you. I can make excuses with the best of you. But because other people make excuses is not a license for you to do nothing. Instead, consider that a call to action. What action, you ask? Follow this link to listen and then leave a comment below. You'll also learn what choices I made about the Halloween candy at the Big Box Store! What tips you do you have for being making better choices? Deana M. Waters, ACP, is employed by Cook Schuhmann & Groseclose, Inc., in Fairbanks, Alaska. 1. What prompted you to choose a paralegal career? Shortly into my career as a teacher, I discovered I did not like teaching English and history. I consulted with my alma mater’s career services. Several vocational tests later, I decided to go back to school to become a paralegal. This profession has “fit” so much better than teaching high school ever did. 2. What is your favorite part of your job? Analyzing and organizing medical records and other documents, investigation, and preparing for trial. I love to connect the dots and discover the patterns in records. 3. What professional associations do you belong to? Fairbanks Association of Legal Assistants and NALA. 4. How has your membership benefited you? Definitely the networking in both organizations. I’ve taken calls locally and from other states asking about the rules, forms or procedures in our jurisdiction. 5. What has been the highlight of your career? Being appointed to NALA’s Continuing Education Council in 2010. I will be chairing the NALA Campus LIVE! committee this year. Also being asked to teach in our local paralegal program, which I’ve done since 2006. 6. What do you see as hot trends in the paralegal industry? Paralegal education, legal technology and regulation. 7. If someone contemplating a paralegal career asked you for career advice, what would your answer be? Choose your school wisely. It is very difficult to find a paralegal job with experience alone, so some kind of formal education is likely a necessity. An online program may sound appealing, but will an employer recognize the program’s credentials? Will the online credits transfer to an on-the-ground school? A quality education will take you farther than a quick or inexpensive one. Emphasis your other skills, such as medical training, accounting or even construction experience, that may be valuable to employers (lawyers love 2-for-1 paralegals). 8. Is there a quote that inspires you? “I do not agree with what you have to say, but I'll defend to the death your right to say it.” Voltaire. 9. You've enjoyed a successful paralegal career. To what single event or person do you attribute that success? My husband, Brian. He supported my education when we were dating in college and has continued to do so as my career developed and grew. I could never have studied for the CLA/CP exam or started teaching without him taking up the slack at home. My mother also showed me that the circumstances we are raised in have no bearing whatsoever on our success. One can strive for success or settle for mediocrity. 10. What is the most important step a paralegal can take to keep his or her career interesting? Keep learning. Try a new practice area or take a class on a topic outside your experience. The law is dynamic and ever-changing as society evolves. Imagine how boring our profession would be if every issue was exactly like the one before…. 12. 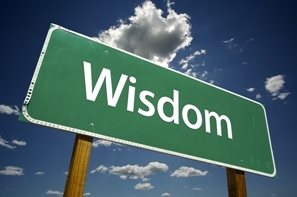 What advice would you give yourself if you met you as a first-year paralegal? Be more confident! Ask questions and seek guidance when you aren’t sure if you’re on the right track. What you learned in school is only the foundation of what you need as a paralegal. It’s OK to take extra time on a project to ensure you are producing quality work product until you become more experienced and comfortable in your job. 13. Is there one thing in the world you wish you had the answer to? What do dogs really dream about? Bonus Question: Is there one gadget you can't live without? My semi-smart cell phone. Wednesday's Wisdom: Are you reactive or proactive? In today's Wednesday's Wisdom, I ask: Are you reactive or proactive? Reactive people have a tendency to respond to things that happen, rather than making them happen. Their responses are hasty. Another term that applies to their responses is "knee jerk". Proactive people, on the other hand, are always looking ahead. They look at future activities, projects and events and then anticipate needs, problems and possible outcomes. Today I provide 5 weapons you can use to handle almost any situation proactively. Follow this link to listen and then leave a comment below. What tips you do you have for being proactive? How has acting proactively saved you from "hitting the iceberg"? You have done well in school and you finally have your paralegal degree. You were certain law firms would be banging on your door on graduation day offering you fantastic jobs. Didn't happen? You're not alone! Unfortunately, this is an issue for many new paralegal school graduates. 1. Update Your Resume – Often. “An update?” you gasp. “Why update a perfectly good, nearly new resume?" Your resume should be a work in process because “one size does not fit all”. It should be customized to each position you are seeking. Read the job details carefully for the specific requirements and then tailor your resume to that job. Limit to your resume to 1 page and print it on nice white paper. Do not use anything fancy or colored. Be sure your resume spotlights your skills and experience. You have no experience? Not true! You have been in school, you may have done an internship, perhaps volunteer work, and what about your previous jobs? You may not highlight each one specifically but do highlight the the experience you gained and the skills you learned to demonstrate how those apply to working as a paralegal at the specific job you are applying for. 2. Take A Job While Waiting/Looking for THE Job. In this economy, you may not find the dream job you thought would be waiting for you when you finished your education. It is important to be employed, though, if for no other reason than you like sleeping indoors and eating 3 meals a day. This is where taking “A JOB” comes in. Look for something related to the field so you can gain get that experience under your belt. You may not be working as a paralegal but come as close as you can. Consider targeting a law firm or corporation where you would eventually like to work and take another job there just to get your foot in the door. You should also consider doing some volunteer work with a legal aid clinic or the court system. You will not only gain a lot of practical experience, but it will look good on your resume and show what you have been productive during your unemployment. A JOB will be of assistance in making connections that that may lead you to THE JOB. 3. Leverage the Internet and Social Media. The importance of participating in social media (LinkedIn, Facebook and Twitter in particular) cannot be overstated. Even if you don’t find a job through social media (and it is possible you will), it provides you with exposure to other professionals. It also affords you the opportunity to research would-be employers. 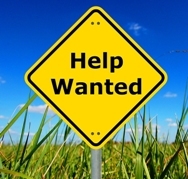 Potential employers use social media to search for information on prospective employees. You will want them to find you there and see that you would be a spectacular employee. Having a professional picture posted on these sites is essential so have one taken NOW. LinkedIn is particularly important because it is a professional “resume type” site. You can join forums, participate in discussions, and make new contacts. Also, ask people you know to give you a recommendation on LinkedIn. Whatever you do, though, do not allow the Internet make you invisible. Read on! 4. In-Person Connections Remain Key. This is not the time to hide out in your home office surfing the web for a job. The truth is that your next job is probably right in your back yard, so to speak, because personal connections are a primary source of hires. You should focus the majority of your efforts on face-to-face networking. So many jobs are found by word of mouth that you have to network both with the people you have known forever and with anyone new you can meet. Begin with the people you knew in school (fellow students, professors, guest speakers), and widen your web to the people you met while you were interning, members of your local association. Join that association and attend any events possible, including job fairs and CLE events. You never know whom you’ll meet today that will recommend you for a job tomorrow. 5. Walk the Walk and Talk the Talk. Dress, act and speak like the professional you aspire to be. Your student days are behind you so do not revert to “student casual” clothing when you are networking. Professionalism should be at the top of your mind when you are on social media, too. Never post anything (including pictures) that you would not want your mother OR a future employer to see. Remember, getting a job IS your job – for now. Deb Elkins, ACP is a paralegal with Mesch, Clark Rothschild, PC in Tucson where she specializes in Chapter 11 Bankruptcies. 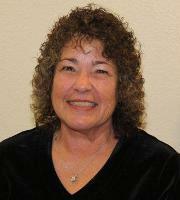 Deb attended the University of Arizona and has been a NALA Certified Paralegal since 1982. She received her ACP in 1993. Thanks, Deb! 1. What prompted you to choose a paralegal career? I was attending the University of Arizona when a notice came around inviting students to participate in a graduate study attempting to identify a person’s career path. I took the plunge and while I was majoring in German, Russian and Linquistics, the study indicated my path should be in law! Since my mother worked in the legal field and I was finding the UofA was not the path for me, I obtained a job in the legal department at the UofA and that was the beginning. 2. What is your favorite part of your job? Initially, I enjoy working with clients directly. That in and of itself, provides a much better understanding of the ultimate goal for that client. Then, achieving a successful result for our clients brings me a feeling of fulfillment knowing that a business will keep going forward, while keeping its employees working, and helping the economy in a positive way. 3. What professional associations do you belong to? I am proud to say I am an Honorary Lifetime Member of NALA! I have been a member, officer and director of the Tucson Paralegal Association since 1981, and I am an associate member of the Pima County Bar Association, serving as a Liaison to its Board of Directors. 4. How has your membership benefited you? Friendships, knowledge, encouragement, support, empowerment…and many more positives than I can think of at the moment. I have often referred to myself as a NALA Groupie and I say that with a big smile. I have learned how a Board can work together, discovered different forms of governance, met colleagues from around this country and outside this country, and shared thoughts and concerns. 5. What has been the highlight of your career? I have received more in the way of accolades then I believe I deserve, but to single one out is difficult. Being named a runner-up for Paralegal of the Year 2000 by Legal Assistant Today was definitely a highlight, but I believe serving on the NALA Certifying Board and the NALA Board of Directors gave me my biggest thrill of all. 6. What do you see as hot trends in the paralegal industry? Technology, technology, technology…without it, I could not perform my duties effectively. I have been lucky in that my firm is very concerned about keeping up with technology and has provided extensive training for all employees in all types of software programs, including utilizing features of common programs many of us did not know were available. I believe it is critical to not only know and understand laws and rules, but to also be able to utilize all available tools. 7. If someone contemplating a paralegal career asked you for career advice, what would your answer be? Study, learn as much as you can, sit for the CLA exam, get involved with your local association, ask questions, learn the technology developed for the legal field, and always remember that getting one’s foot in the door is the first step. After that, it is up to the individual how many stairs to climb to reach the ultimate goal and stick to it – keep going! 8. Is there a quote that inspires you? “Together we can do the extraordinary.” Mt. Olive Baptist Church on N. 4th Ave. These few words say so much. 9. You've enjoyed a successful paralegal career. To what single event or person do you attribute that success? Actually, there are two persons: The first was an attorney in the first large firm I worked for. He took the time to teach me the fundamentals of commercial law when there were no schools providing paralegal education, and gave me the encouragement to push harder, to learn more, and to take on more responsibility. The second was an office administrator who nudged me into becoming involved with the local paralegal association and sent me to my first NALA Convention. 10. What is the most important step a paralegal can take to keep his or her career interesting? For me, learning about other areas of law through continuing legal education. Knowledge of other areas of law has enabled me to see the commonalities and parallels. As a commercial bankruptcy paralegal, I believe understanding many areas of law is critical as those other areas seem to come into play in the bankruptcy courts. 11. What was your first car? A 1964 Ford Mustang – Yeeha! 12.What time in the morning do you first check your email? As soon as my computer comes up, I check my inbox, review the spam filter reports, and look for messages from clients. Also, because I perform the docketing task for our bankruptcy section, I have to have my email open at all times as we have mandatory electronic filing in the Arizona Bankruptcy Courts. 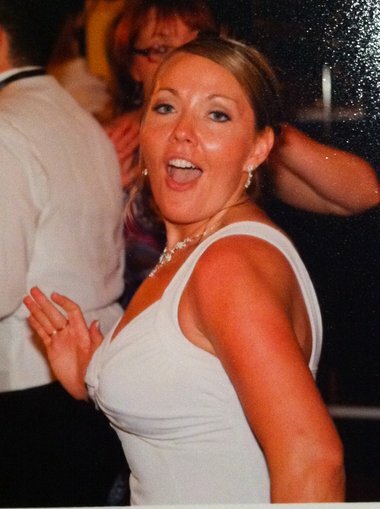 Tessa Conradi-Marrella, President of the Pacific Northwest Paralegal Association, was just 32 years old when she died in a traffic accident on February 7, 2011. While nothing will bring Tessa back and she will forever be missed, it is comforting to know that the man responsible for her death has been sent to prison. Tessa was doing everything right. She was wearing her seat belt. She wasn't talking on her cell phone. And she had not had any alcohol before getting into her car early in the morning of Feb. 7. But at the intersection of Northeast Portland Highway and Cully Boulevard, the 32-year-old paralegal crossed paths with Jesse Lee Ream, who had a long history of doing everything wrong. Ream, whose blood-alcohol level was three times the legal limit more than three hours after the crash, T-boned a borrowed Chevy Suburban into Conradi-Marrella's Kia Sportage, killing her instantly. Ream entered a guilty plea to manslaughter and no contest to failure to perform duties of a driver, driving while intoxicated and other counts in July. Multnomah County Circuit Judge Janice Wilson cited his 22-year-long record of alcohol-fueled arrests, convictions and driving infractions in sentencing him to 20 years and seven months in prison, imposing the maximum penalty for first-degree manslaughter and four other counts and ordering Ream to serve them consecutively. The decision followed a long apology by Ream and nearly five hours of emotional statements from friends and family members from both sides who filled the courtroom to capacity. Family and friends of Conradi-Marrella, wearing bracelets in her memory and T-shirts urging "Please don't drink & drive" told of her generosity, friendliness and commitment to her profession as the president of the Pacific Northwest Paralegal Association. They also talked of the devastation her death has caused the family. Ream's legal troubles are not over. He, his sister, brother-in-law and two bars are defendants in a $7.1 million civil lawsuit filed by Conradi-Marrella's husband. The latest edition of The Paralegal Voice, “Trends in the Paralegal Profession,” co-hosted by Lynne DeVenny and me, is now available at Legal Talk Network. How do you keep up with constantly evolving trends in the paralegal field and stay ahead of the pack? Guest Jeannie S. Johnston, Founder and CEO of ParalegalGateway.com, to discusses the latest trends in the industry, how to use social media, favorite publications and blogs, why we use RSS feed readers, and how to make the most of paralegal association membership. Listen in as Jeannie begins the show by taking a look at Paralegal Gateway and what it offers. The Paralegal Voice also thanks its sponsor: NALA...The Association of Paralegals and Legal Assistants. Remember...you can make sure you never miss a podcast by subscribing to any Legal Talk Network show, including The Paralegal Voice, by using the RSS Feed links or iTunes links at http://legaltalknetwork.com/rss-feeds/.